1. automatically switch four kinds of modes, easy to use. 2 will be issued after five minutes automatically shut down after the tweet. 3 intensity mode can be selected according to skin condition. 4 beauty instrument using a titanium head massage, sensitive skin, you can also use oh. 5 after the first charge can be used about 10 times. With oil-free lotion (such as exfoliating water) and cotton, as deep cleaning, exporting pores grease, dirt. to use: Even with the use of cotton and lotion. With no oil moisturizing lotion applied to the face, and then export and import of the machine ahead of moisturizer and gently massage. meticulous and through a dedicated micro-oscillation pulse signal, with moisturizing lotion, moisturizing ingredients can make fully penetrate into the skin. to use: no need to use cotton, lotion applied directly to the face, and then export and import of the machine ahead of moisturizer and gently massage. 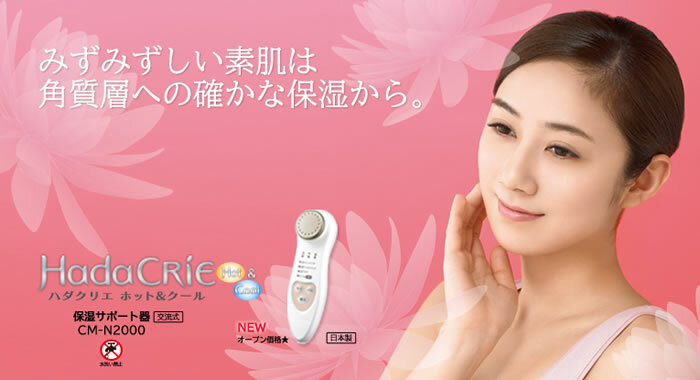 slight vibration in a gradual electrode, the effect imitate mask and lotions. to use: Use with lotion or facial mask (water mask). the system on the back of the fuselage head cold, head cold for about 10 system completely cooled, compared with CM-N1000 needs 90 seconds before refrigeration, much faster, can shun between the cheeks, nose and forehead pores to close tight. to use: Use the back of the fuselage made ​​cold head and gently press the surface. step1: use heat to make the pores open. step3: close small pores Zhongwei import lotion, or when side dressing mask while import. "Hadakurie" a major breakthrough in cold and warm double head design. In about 40 degrees warmer new head, to open the pores, the pores of dirt deeper cleared. Can make the skin more moisture to keep moist longer. 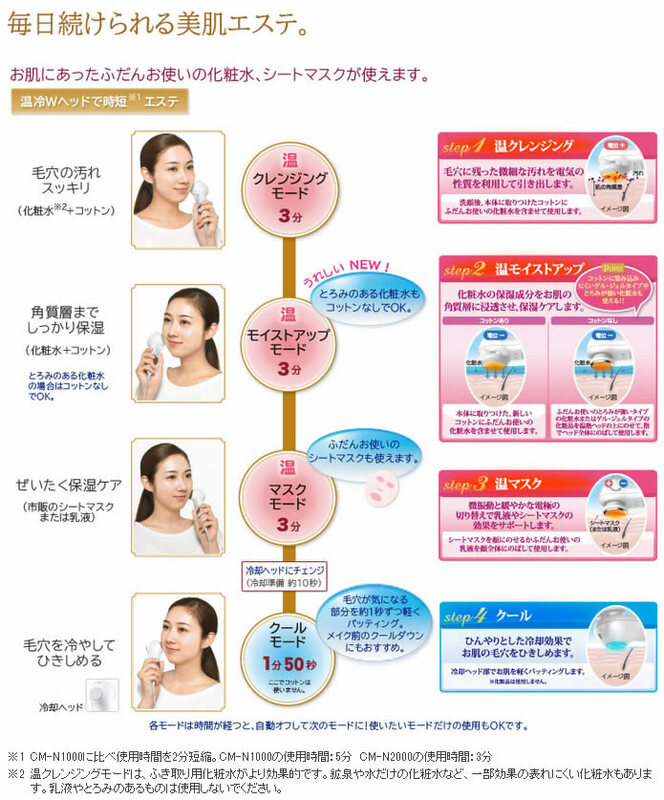 Four kinds of operation modes: warm cleaning mode, warm moisturizing mode, warm mask Mask mode, COOL cooling mode. Titanium metal guide head: prevent sensitive. You can use the usual weekday lotion. Dual power or AC voltage of 100-240 volts, travel applicable, the world apply. Beauty nose moisturizing and cleaning holes. Equipped with "auto-off feature" automatically stop within five minutes. 13 years of the new CM-2000. With warm (front) plus frozen (after) the guide head, enhance cleansing and moisturizing effect, can be adjusted according to skin condition and strong, medium and weak three efforts to export and import. Has a cleansing, moisturizing, import, whole muscle four kinds of functions. Can give the skin cuticle sufficiently improve the ability to nourish the skin against external stimuli. Improve skin moisturizing, you can truly feel at home, beautiful skin beauty salon experience. Improve moisturizing cuticle is to create perfect skin foundation. Outermost layer of the skin is the stratum corneum. Healthy skin cuticle should retain sufficient moisture. Aggravate dry exfoliation can cause loss of water, which is the reason for dry, rough skin. Improve cuticle moisturizing effect is to ensure that primary care focus. Hada CRiE ionic strength moisturizing ingredients penetrate the cuticle to prevent moisture loss of credit. Therefore long-lasting moisture. a product is to use the electrical properties of cosmetic beauty instrument, do not use makeup. 2 Everyone personality differences exist in the way to remove dirt, so the effect is different. 4 this step "skin water" can not use lotion or a mile-shaped products. 5 Use a cosmetic cotton. Installed a cotton pad soaked "Lotion" stick slip on the skin after it. "Wipe skin care water" better.